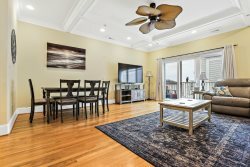 The Sunskipper is a great 2 bedroom 2 bathroom vacation rental condo at Carolina Beach with ocean views and access to 2 swimming pools. This unit is directly across the street from the beach and has 2 amazing decks where you can view the ocean and hear the surf. This unit offers a washer and dryer in the unit, tile floors throughout, a king sized bed in the master bedroom, and much more! The second bedroom has a queen sized bed. You can walk to the Carolina Beach pier to fish or enjoy a snack or beverage, or just enjoy the views. Freeman park is a 4 wheel drive access beach is located just a few blocks north. This property is fully furnished with a stocked kitchen and is a perfect place for your family and or friends to enjoy a beach getaway! No need come by our office and wait in line to pick up a key. This home is equipped with a key less entry lock so you can start enjoying your vacation the minute you get there. Essentials such as paper towels and toilet paper will be supplied to get your vacation started! Linens and towel rentals are also included in the price. There are two outdoor Swimming Pools available for your use while staying at the Sunskipper, just a short walk down to buildings B and E.